The St. Paul Church is a ruined church that is a popular tourist attraction in Goa. It is located on the road that one takes from Old Goa to reach Ponda. One can always hire local transport to reach this lovely church. 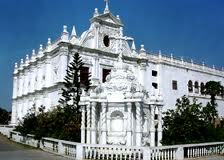 The church of St. Paul in Goa was set up because of the efforts of two priests namely Diogo de Borba and Miguel Vaz. These two priests had established Santa Fe confraternity in India. The construction of the church was finished on 25th January, 1543, which is the day of Feast of Conversion of St. Paul. The St. Paul church was a very famous educational institution in India and was considered among the leading educational institutions here. Not only was primary education imparted here, but one could earn a degree in higher education in subjects like Music, Latin, Arts and Sciences. Higher education included a Master's as well as the Doctorate degree. Some years later the old building was demolished and two separate buildings were constructed that were connected by a common passage. There was a big library, a hospital as well as a house for those who were converted recently. The St. Paul church was also credited to have set up the first printing press in Asia. The first printed publications were circulated from this place only. Around the year 1560, this building was pulled down and the foundation was laid for a bigger church. However, there was stringent opposition from Augustinians and Nuns of Santa Monica. In fact, the building was set afire at least four times by some enemies of Jesuits between 1591 and 1675. The church also had mortal remains of St. Francis Xavier that were preserved in a silver casket, which was later shifted to Basilica of Bom Jesus. In the year 1829, the government decided to demolish it properly since it was already in a dilapidated state. The archway and some part of the front entrance still remains on the road that leads to Ponda from Old Goa.